The new report by Zion Market Research on the “Biologics Outsourcing Market by Product (Antibody, Recombinant Protein, Vaccines, and Others), by Type (Kits & Reagents and Instruments), by Sources (Microbial, Mammalian and Others) and for Applications (Vaccine & Therapeutics Development, Blood & Blood Related Products Testing, Cellular and Gene Therapy, Tissue and Tissue Related Products Testing, and Stem Cell Research): Global Industry Analysis, Size, Share, Growth, Trends, and Forecast 2016 – 2024" has a vast information about the market and its potential. 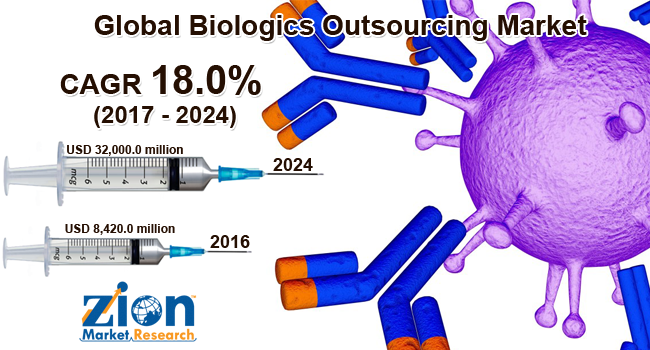 The global biologics outsourcing market was valued at around USD 8,420.0 million in the year 2016 and it is expected to reach approximately USD 32,000.0 million by 2024. The global biologics outsourcing market is expected to exhibit a CAGR of more than 18.0% between 2017 and 2024. Our research analysts observed that demand for the biologics outsourcing will increase significantly as the partnering enables pharma to focus on capabilities and minimize investment in specialized technologies and capacity while getting better products to patients faster. The sector’s faster growth above the pharmaceutical industry is helped by the anticipated transition to more outsourcing, as well as the good growth within particular subsectors. Biologics contribute to the major segment by revenue in the pharmaceutical sector and are expected to continue during the forecast period. Biologics have received heavy investment for new facilities, motivated by anticipated growth and margins, whereas small molecules have been less favored. Overall, pharmaceutical outsourced manufacturing is expected to increase in the coming years. There are several types of products in biologics which are outsourced. High use of antibodies for treating a number of chronic diseases such as asthma, diabetes the segment is expected to dominate biologics outsourcing market throughout the forecast period. The monoclonal antibodies sub-segment in antibodies will contribute to the major share owing to increased applications in the Pharma & biotechnology industries. The ongoing breadth and depth of research and innovation within the antibody engineering field ensures that monoclonal antibodies based products will boost the market. Presence of a substantial number of products manufactured through the use of microbial sources is the major factor that is triggering the growth of the biologics outsourcing market. Thus, the microbial source is contributing a major share in the market growth. The kits & reagents segment by type will hold the major share in the global biologics outsourcing market. Owing to their repeated use in clinical trials, and R&D activities. The vaccine & therapeutics development are dominating the biologics outsourcing market in application segment due to the increasing disease prevention concern and increasing clinical infrastructure to develop more precise medications to meet the unmet need globally. The major market players in the Biologics Outsourcing market are Boehringer Ingelheim GmbH, Catalent, Inc., GenScript, Innovent Biologics, Inc., Syngene, Shanghai Medicilon inc., GL Biochem Corporation Ltd., GVK Biosciences Private Limited, Horizon Discovery Group plc. Innovent Biologics, Inc., Selexis SA, Lonza, Abzena PLC, Adimab LLC., among others. The global biologics outsourcing market is segmented on the basis of the product, type, sources, applications and the geographical regions.